I currently collect information for my bachelor thesis and want to compare popular RISC-V implementations. Does there exist a documentation or has somebody knowledge about how the RISC-V cores match to for example ARM cores. Thanks for the info, SiFive indeed has a nice breakdown, and we should also do something similar. As a research group we do not have the same manpower to work on these things, so it takes a bit of time for us to get it done. 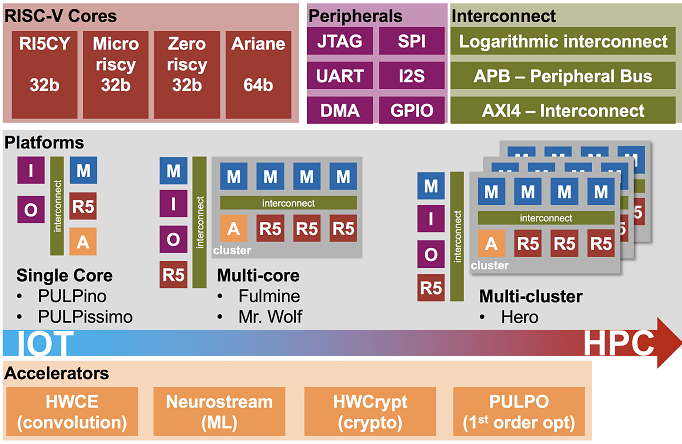 Notice that RI5CY is the RISC-V core, and PULPino is the (older and simpler) micro-controller that can use RI5CY (or zero-riscy or micro-riscy) as its core. The newer micro-controller architecture is called (PULPissimo) and it can also use any of the three 32bit cores we have. I might add another group for high performance out-of-order architectures.